A friend taught me to make soap at the start of January. She just taught me to follow a simple recipe using tallow, olive oil and coconut oil, with the cold process method. We have been using that soap in the bath and in a soap shaker for doing the dishes, and its surprising how fast we use it, so it was time to make some more. 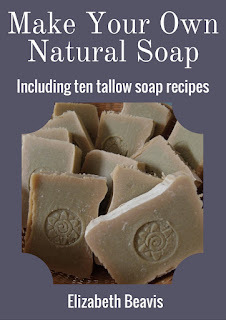 I rendered the rest of the tallow in the slow cooker again and read a book about soap making, so that I could figure out my own recipe this time. I first wrote about pickling cucumbers last year, and since then I have made many batches of delicious pickles and I think I have perfected my method, so its time to tell you more. You can pickle any type of cucumbers, but I like to grow the proper pickling cucumber or gherkins. They grow really well in my garden, even when its hot and dry, they do better than other curcubits. I usually get plenty from 2-3 plants. I like to pick them small, around the size of my thumb. Only because when they get too big its hard to fit many of them in the jar! It can be like a bit of a puzzle fitting them all in. I also grow my own dill to flavour the pickles. It tends to bolt to seed, so I have to keep picking it regularly and I put it in salad if I have more dill than pickles. We are only new to the cattle industry, and I may get some of the terminology wrong in this post, but I was hoping to explain a few things that I've learnt about the cattle industry in Australia. Broadly speaking, there are three different types of cattle operations. The first is “cow and calf”, where you own a number of cows and a bull, aim to produce one calf from each cow per year, and either fatten the calves or sell at weaning age. This leads to the second type, which is to buy those weaners and fatten them to feed-lot size. Finally, some very dedicated and skilled individuals will chose to run a stud, producing consistent pure-bred cattle, particularly bulls, which may be purchased by cow and calf operations as breeding stock. Each type of operation has its pros and cons and the one that’s best for you will depend on your land, your available time, and knowledge of cattle, and of course you can have a bit of a mixture if you want to. I've been "worm farming" since a friend gave me a small handful of worms from his farm and I set up a worm farm purchased from Aldi. The worm farm has two trays and a vessel underneath with a tap to catch all the worm juice. I started with the bottom tray empty and the worms were in the top tray with vege scraps, covered with their blanket and the lid. At first I didn't need to feed them much, just the occasional lettuce leaf, but they multiplied very quickly, and were soon ready to eat all our vege scraps. Finally I filled the top tray and swapped the trays, so I had the empty tray at the top again. When the top tray was full again, I needed to empty the compost from the bottom tray. Tromboncino! I love saying the word. I only just goggled it and found out that I've been spelling it wrong, not enough 'n's. Well its difficult when you come across a vege that you've never met before, you don't know how to pronounce or spell its name and you don't really know how it will grow, when to harvest or how to eat it! I suppose that adds to the excitement. And there's always the possibility that a new vege may grow really well in your conditions AND taste nice too. I was given tromboncino seeds by a lovely lady at our permaculture group (thanks Judi!) and I wasn't really sure what to expect. I had read about them on Linda Woodrow's Witches Kitchen, so I know that they like to climb and that I may get more than I could eat. Just in case, I only planted three seeds, and two of them made it out to the garden, planted next to the fence, so they could climb up if they wanted to. Its that tricky time of year again, in between seasons, where I try to guess the optimal time to give up on summer crops, and make room for winter veges that will survive the frosty mornings. At the moment, I still have a few green tomatoes which might ripen in time, a few eggplants, chillis, capsicums and lots of basil. At the same time, there are brassica seedlings and parsley popping up all over the garden! I am moving them all to my nominated brassica garden bed. Its great to have volunteers, but I'm not sure which are which yet and I worry that I won't have one of everything. I think I will still have to plant a few of each variety, just to be sure I don't miss out, but I definitely have a headstart on a few of them, there is broccoli and tat soi doing well already. We've been very slow to start using electric fencing. It all seemed very complicated to me, which is stupid really, I did study physics at high school and university, I should be able to understand how an electric fence works! Maybe I was over-thinking it, because now they seem very simple and very very useful. If you have a small area that you need to fence permanently or temporarily, electric fencing is the cheapest, most flexible and quickest method. I seriously don't think we'll be doing much more barb-wired fencing, apart from our perimeter fences and maybe to split up our largest paddock. For a simple temporary fence, all you need is electric fence wire or tape, fence posts or clips to attach to an existing fence, an energiser and a battery (unless you get a mains powered energiser). We usually run the wire/tape out around the area, and then position the posts at sensible intervals. We set up the earth, connect the energiser to power and turn on the fence. A while ago I had a lovely tea with ginger and rosella. It got me thinking maybe I should try to grow some rosellas myself, so this season when I was offered some seed (thanks African Aussie!) I planted some and ended up with four in big pots. I kept them in pots because I was a little unsure what to expect. I didn't know how big they would get and where they would prefer to grow. I find keeping unknown plants in pots the first year helps me if I need to move them around to find the best spot for them. Next year I'll probably plant them out in the garden instead. I am still waiting for mine to flower, even though I planted them in September, but a friend of mine had excess fruit from her plants and gave me a bag of them. I decided to dry most of them for tea, and kept a few to add to a fermented drink. We have had Molly since she was about 4-5 weeks old, she came here with Bella nearly two years ago now, they are both pure Jersey cows. At first Molly was a crazy, flighty calf, that ran from us every afternoon when we wanted to lock her away from Bella, so that we could milk Bella in the morning. Eventually she got to know and enjoy the afternoon bucket of grain and would follow me into her calf yard. We used that opportunity to get her used to being handled by us. Its certainly been worth all those afternoons stroking her as she ate her grain, she is quite tame, but not as tame as Bella, who was bottle raised. 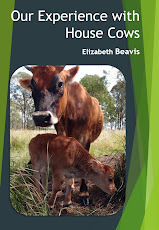 Some cow books advise you to bottle raise your house cow, to make sure she's tame, but that is a lot of work, and I think Molly has grown up big and strong because she was nursed by Bella for over a year. We wouldn't have kept it up for that long if we were bottle feeding her! I'm now up to the forth permaculture principle, so I think I should start by going back over the first three principles in case you've forgotten what I'm talking about, before I launch into "apply self-regulation and accept feedback". Permaculture is a design system based on ethics and design principles which can be used to guide efforts made by individuals, households and communities towards a sustainable future. (http://permacultureprinciples.com/)Permaculture is based on three ethics: earth care (sustaining natural systems), people care (making the products of natural systems available to people) and fair share (governing our needs so that resources are available to all). When we first got our cow, Bella, I had read “The healthy house cow” and really wanted to make raw milk yoghurt because Marja made it seem so easy and healthy, but every time I tried, I just ended up with a mess. Last week I wrote about incubating chicken eggs. If you are incubating eggs and you are as successful as we were, you will end up with chicks to look after. We currently have 33 chicks in a box in our lounge room! I was recently contacted by a lady who was about to buy some chicks and didn't know what to feed them. When I went back to my last post about caring for chicks I realised that I’d missed some important details and changed my mind about a few things. So here is an updated version. Chicks need three things: a safe, warm place to live; water and food. When chicks first hatch, they don’t have many feathers, so they need to be kept warm, around the same temperature as the incubator (38degC) at first and then gradually cooling as they get bigger. We keep our chicks in a large wooden box. You don’t have to use a wooden box, any kind of strong, draught-proof box will do. I have seen plastic, cardboard and metal boxes used as well.